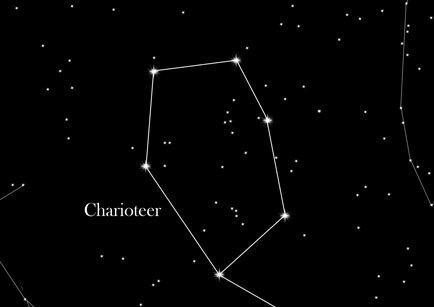 The Charioteer is one of the 48 constellations described by Ptolemy. In about 13,000 years the carter will mark the celestial equator. Due to its expansion and position, the Charioteer is an easily recognizable constellation. The Babylonians came up with the current name of Auriga. Auriga means "charioteer" or "Helmsman" in latin. With just one star in the neighboring constellation, Taurus "borrowed" a star in the Charioteer which is a almost regular pentagon. Its main star, Capella, is the third brightest star in the Northern sky. The southernmost star Alnath, which completed the pentagon, was earlier known as γ Aurigae in the constellation Auriga. After determining the constellation boundaries in the "International Astronomical Union" (IAU), this star is today, however, in the constellation Taurus. Through the center of the constellation goes the starry band of the Milky Way. That's why there are some interesting items, such as some star clusters and bright nebulas to observe. In the Greek mythology, the son of blacksmith Hephaestus, named Erichthonius, is associated with the constellation Auriga. Erichthonius was the creator of the quadriga, a four-horse chariot used in battles. When he beat Amphictyon in battle, he became the King of Athens. This was in large thanks to his intelligence, and Zeus rewarded him after he died with a place in the sky.